Previous work done so far by global citizens on this theme can be read at the following links. Share your Vision of Earth in Year 2024. Scenario of humanity between now and year 2024. Global Parliament is the only practical solution for humanity, all life on Earth. Global scenario: a vision describing Global Civilization overall picture. This is year 2024. The world is now on the pathway. Gross Sustainable Development Product (GSDP). Measurements of GESDI and GSDP provide insights for the discussion of issues. To-day's children evoke a VISION of Global Civilization of the 3rd Millennium. A sound governance and management of life on Earth is needed for the long term survival of our species. Global Civilization has already described a scenario of Earth in year 2024. This is year 2024. Earth is now on the pathway. Earth has chosen its future and has made the evolutionary leap. Global Community concepts were successful in bringing together the billions of people on Earth. Everyone is now responsible in the management of Earth. Humanity's new vision of the world is about seeing human activities on the planet. Global Civilization Overall Picture describes the situation in all nations of the world, which was divided in different regions: North America, Central America and the Caribbean, South America, Africa, Europe, Asia, South-East Asia, Middle-East, and Oceania. To-day's children evoke a VISION of the Global Civilization of the 3rd Millennium. 23. Global Parliament vs the United Nations. 28. Preventive actions against the worst polluters on the planet and those who destroy the global life-support systems. Vision of the Earth, all Life, now and in year 2024. Is humanity as we know it today on Earth our final destination?. 40. Criteria to obtain one ECO, the Certified Corporate Global Community Citizenship. 48. Agriculture, its practices in the field, and needs of Global Civilization. 58. Because of the ways it is affecting us in North America and Global Civilization, Canadians want to have a say in the decision-making of U.S. Government foreign policies and of the type of actions to be taken concerning potentially dangerous situations. 60. Global governance and global civic ethic. The Right Minds, The Right Ideas, The Right Time. A global community of a million people is more fluid and dynamic and is a necessity for the survival of humanity for the next million years. World overpopulation at the turning point requires from each and every one of us a statement of rights and belonging to Global Civilization, the human family. Businesses and trade will profit more by operating within a global symbiotical framework. Criteria for becoming citizen of Global Civilization. Global Community citizens take environmental law into their own hands. Impacts of human activity on global climate, agriculture, wealth, health, security and all life on Earth. World overpopulation and its global problems by year 2024: a threat to humanity. Scenarios of humanity between now and a million years. Global Community establishing a global action plan for the survival of life on our planet. We are asking all Global Citizens to participate during Global Dialogue 2018 to offer their views taken toward creating a sustainable future for Earth over the next few years. We want everyone worldwide to be free to participate in developing a common Vision of Earth in Year 2024. We want you to be involved in shaping a sustainable future for life on our planet. Everyone will have the opportunity to comment on the draft recommendations. Results obtained during the Global Dialogue 2018 will be added to the Vision and we will also have a session on creating the Vision. Results will be added to the proceedings of Global Dialogue 2018 to be published afterwards. It is very important that everyone conducts his/her own brainstorming exercise on every issues. Everything you will come up with will be added to everyone else brainstorming ideas. We will compile all thoughts on every issue. Common grounds and trends will appear at the end and lay the groundwork for conclusions. What direction should Global Civilization take over the next few years? Tell us the goals and values that are very important to you and which you feel will help create a sustainable future for Earth. The management of our affairs on the planet has become of vital importance, and we want you to see how your share of participation can help to sustain life. to sustain Earth, all life. More relevant and comprehensively asked questions were included here on the Scale of Global Rights . We ask everyone who considers him(or her)self a global citizen, to take part in all local consultation processes, and to make known his idea for a sustainable solution to the community issue at hand. Such action will have positive results for Earth. Obviously they do! Our brains are much bigger than those of other lifeforms; they are more complex that is they contain more neurones which are connected to each other in more intricate ways. When we observe the world, our environment, we take into account more factors than other lifeforms, and we are able to respond to any one of those factors in a greater variety of ways. We are also able to observe, analyze and infer the rules and laws of the behavior of the things around us. Science is a way of searching for those laws. Once human beings grew the ability to achieve	such mental ability, our power over the other lifeforms, big and small, increased enormously. In our distant past, human beings may have been the cause for the disappearance of the biggest predator lifeforms on Earth. We probably use them as food. We became formidable and proficient hunters. We are probably the cause for the disappearance of millions of species of which we know nothing about nowaday. Only a few skeletons remain accessable for observation as witness of the past. Human beings have enormous stamina, and we are better able than many lifeforms to tolerate daytime heat. To increase efficiency, we have also cooperate to hunt. Our logistic ability in hunting efficiency, brought about by memory,	analysis, and cooperation, largely accounts for the disappearance of much larger predators. We killed and ate them all. And we had already mastered the use of fire a long time ago so cooking meat was making it much more pleasing and palatable. Fire had the effect	of increasing the range of human diet even more widely. Later on farming not only widen our diet and thus increased our chances for survival but was the cause for creating the very first cities. Are we getting any closer to explaining how do other lifeforms think? Not yet! First of all how do we think? A human being thinks verbally and other lifeforms think in some other way, or is there more to it than that? What is the relationship between thought and verbal language? Does human thought depend upon words? We may also ask the question does any sound produced by any lifeform depend upon the idea of the sound in the lifeform? Obviously not! Because we are capable of synthesizing knowledge and information in a flash means we dont always think with words and words are not the necessary raw materials of thought. The thoughts themselves flow in us as in other lifeforms. They flow in our brain and make contact with words or we label them as words. Because words are labels attached to ideas, we can manipulate words as if they were ideas themselves. That is the human way, other lifeforms have other ways. We do not think in words. If we did how is it that it would take us hours, or days, to express and explain one thought to a colleague? All lifeforms are conscious of thinking to some degree that is different from lifeform to lifeform. Through consciousness we know that we are thinking. Through verbal language we tell ourselves that this is the case. Our possession of verbal language seems to make us more conscious than any other lifeforms. Our conscious thoughts are mostly verbal. Other lifeforms have language as well. They have the ability to convey ideas by means of symbols that the receiver understands. We have already mentioned sounds, but they can be sights, odors, etc. These ideas can be saying to the recipient "There is food here", "I am here", "There is danger", and so on. These ideas	can be much more complicated. Human beings have a greater capacity for abstraction than other lifeforms. We can invent sentences that have never	been written before and express new thoughts that have never been expressed before. Who has ever heard of the Scale of Global Rights? And the Earth Court of Justice to prosecute the United States Government for creating global warming, a threat to the survival of life on Earth. The Earth Court of Justice handling problems between nations and the creation of new nations. Hundreds more new thoughts noone has ever thought before. The United Nations never thought that Justice could be and should be for everyone, every nation and everywhere, a universal constant. There should be no exception to Justice especially the United States. What our language has and other lifeforms do not, is syntax, the pattern or structure of the word order in a sentence and phrase. By applying the syntactical rules we convey meaning by word order. Other lifeforms can convey meaning by other means such as an olfactory language, visual language, chemical signals, and so on. But, apparently, they cannot	place their signals in categories and hierarchies and thus convert their vocabularies of signals into anything that resembles a human language. But they can do it in other ways. The human language allows us to communicate any thought from one individual to another. This hability has in turn allowed us to create	communities locally and globally. We have become the human family, and now becoming Global Civilization, with a global consciousness and a unique Soul, the Soul of Humanity. 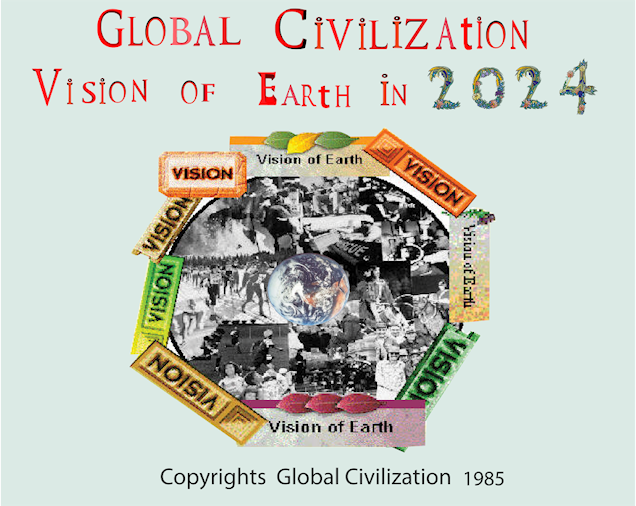 Global Civilization has already described a scenario of Earth in year 2024. Global citizens have already participated in three global dialogues in year 2000, 2002 and 2004 dealing with the theme "Vision of Earth in Year 2024". The webpage links listed above show the work done so far. Participants have presented their views, research papers, and we had workshop sessions and made recommendations to all nations. The Vision of Earth in Year 2024 has resulted from our common work. We gave humanity a sense of direction. But time have changed since year 1985 when we initiated this process and later following global dialogues in year 2000, 2002 and 2004, but now we need to re-open the dialogue and do more work today. And we need your help. Certainly our work is sound. We produced very valuable and original tools to help humanity: the Scale of Global Rights,	Global Constitution, the Earth Court of Justice, global ministries, and we stood for the values we promoted no matter how difficult was	the obstacle. Now is time to expand our work for the good of all humanity, Global Civilization. We will research possible scenarios of humanity between now and year 2024. Everyone is asked to participate. Send your thoughts. A universal quantum computer would be needed to conduct a proper evaluation of a plausible model or scenario of what Earth might become in year 2024. North America, Latin America & the Caribbean, Africa, Europe, and Asia & Oceania. A very important recommendation obtained during previous global dialogues has been the formation of global ministries to manage world activities in a sustaible way. The formation of global ministries is the most important event in human history. Humanity sees the need to manage the world affairs in several aspects of our lives: energy, agriculture, environment, health, Earth resources, Earth management, security and safety, emergencies and rescues, trade, banks, speculation on world markets, peace, family and human development, water resources protection, youth, education, justice, science and technology, finance, human resources, ethics, global rights, sustainable development, industry, and manufacturing products, etc. Global ministries will be given power to rule themselves in harmony with each other. The WTO will not be the only global ministry that can rule on cases related to trade. Global Civilization is calling for the immediate formation of the Global Ministry of Health. The globalization of trade, the extensive movement of people all over the world, the increase of poverty and diseases in developing countries and all over the world, have caused pathogens and exotic diseases to migrate over enormous distances and now, they can be an increasing threat to local ecosystems and communities, economies and health of every human being and all life. Global Civilization is calling this threat of the upmost importance and must be dealt with immediately by every nation. We must manage health in the world. We are calling for the immediate creation of the Global Ministry of Health. There are several Ministries listed here. Global citizens may apply for those positions of leadership. Choose a Ministry and start defining it completely: what it will do, why is it needed, the money needed to run it, the people needed, the work it will do all over the world, etc. Each and everyone of us (and new Participants) can pick a Minister's position and find absolutely everything there is to be found about the Ministry. You may create brain-storming exercises in your community to help you. We will gather all our information and create a new Discussion Roundtable for each Ministry and do more discussion and research. The idea is to pass on to the elected representatives for Global Parliament the work we have done to help them govern Earth. This way representatives will have an idea about what to do before they are elected as representatives to the Interim Global Parliament . Once they are elected they may want to adopt our research work as a starting point for governing Earth. As mentioned before, to each global ministry was added the 'Global Community Overall Picture' which describes the situation in all nations of the world, and we divided the world into five different regions: North America, Latin America & the Caribbean, Africa, Europe, and Asia & Oceania. Each global ministry has a description of what is happening in the different regions. They are actual facts concerning issues we have discussed during previous global dialogues. Issues of global dialogue 2018 are also included in this project. Our work is too create a plausible scenario(s) of what the world could be between now and year 2024. Earth has long been waiting for a truly global governing body based on universal values, human rights, global concepts and democracy. Global Parliament might as well be formed now, there is no longer any reason to wait. Earth management is a priority and is a duty by every responsible person. A democratically elected Global Parliament will now be formed, and we want you to reflect on future effects of such an event on the history of humanity. Certainly one will expect extraordinary changes: a reorganizing of human activities all over the planet; participation by all societies on the planet in solving local and global problems; new alliances forming; north meeting with south in order to gather more votes within the newly created Global Parliament to satisfy power struggles between European, Asian and Western countries; adoption of democratic principles, human rights, global concepts, and universal values by every human being; expansion of global consciousness; gathering and coordinating of forces to resolve social and political problems in a peaceful way (no more conflicts or wars); gathering and coordinating of forces (technologies, scientific research, exploration work, human resources, etc.) 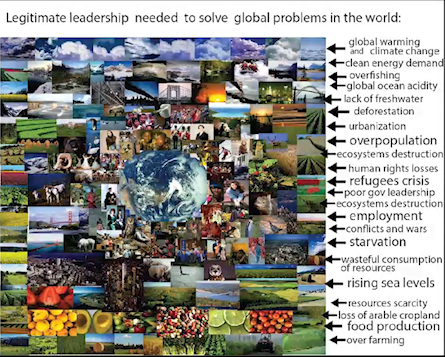 to resolve global problems such as global climate, impacts of human activities on the environment and Earth ecosystems, availability of resources, poverty, employment, etc. Thousands more changes! Let your heart and mind reflect on 'the good' of a democratically elected Global Parliament. Everyone is part of Global Civilization by birth and therefore everyone has a right to vote. Everyone should be given a chance to vote. If you live in a developing country this time you will have a vote, you will be part of Global Civilization, and we will stand by you. Decisions will be made democratically. You will finally have a voice and a friend, many friends, within Global Parliament and Global Civilization. Your lives have values just like all of ours. During the past decades various changes have taken place in political, economic and social institutions. Economic reforms, changes in national policies, and global concerns have contributed to redefine the roles of these institutions for global sustainability. Global Civilization is the new social, justice and political movement in the sense of having a broad organizational structure and an ideology aimed at governing. The environmental movements are also included and express the concerns of groups of people regarding depletion of water, climate change aspects, degradation of land and other changes in Earth ecosystems affecting traditional patterns of natural resource exploitation. Global Civilization has taken the role of helping these groups in protecting and managing the environment by coordinating efforts. Earth Environmental Governance is the most importance and urgent challenge of Global Civilization. Earth Environmental Governance can only be achieved successfully within the larger context of Sustainable Developent and Earth Management. All aspects are inter-related and affect one another. A healthy environment is essential to long term prosperity and well-being of every human being, allowing other lifeforms survive along side with us, and global citizens in Global Civilization demand a high level of ecological protection. This is the 'raison d'etre' of the Scale of Global Rights . On the Scale of Global Rights, primordial human rights and the protection of the global life-support systems and ecological rights are on top of the Scale. These rights are separate categories than the right of the greatest number of people, economic rights, social rights, cultural rights and religious rights. Ecological and primordial human rights are the only rights that have existed unchanged throughout the evolutionary origin of our species. Any major change would have threatened our very existence. All other human rights listed here in Section titled "Scale of Global Rights", are rights created by human beings and can be changed depending of new circumstances; they are not stagnant but are rather flexible and adaptive, and they can evolve. Ecological and primordial human rights of this generation and of future generations are therefore much more important than any other human rights existing now and in the future. It has also become a necessity of establishing the Earth Resources Ministry which itself will be assessing, compiling, managing and protecting Earth resources, and the Earth Court of Justice prosecuting cases involving crimes related to the relentless misused of the Earth resources. Between now and year 2024, Global Civilization will have created the Interim Global Parliament for Global Civilization . The Interim Global Parliament for Global Civilization will govern for as long as necessary to create the democratic structure of the government and put in place the voting system that it requires. Officers and Ministers of Global Parliament will be required to work as a team. Those interested to become officers or ministers please submit your CV, three references, and a five pages essay on why you want to become an officer or a minister. Other minister and officer positions may be added as well. We expect suggestions to come forward between now and August 2018. Several criteria will be taken into account: qualifications of the candidate for leadership, past record as a good citizen, no criminal records, your own financial support (we dont have any funds to pay anyone and for anything), and proven experience and competence in the position. Candidates work strictly on a volunteer basis . You are also required to have accepted in your heart and mind universal values, global concepts, democratic principles, and human rights as obtained and defined in the previous global dialogues. The immediate goals of the Interim Global Parliament are to define and develop each Ministry. All of those who decide to join us will be part of a major research paper to be published on Global Civilization and Global Parliament websites. Our work will be an important part of the Proceedings of Global Dialogue 2018. If it happens that our research was adopted by the elected representatives than we would become founders of Global Parliament. The hope that we can create an Earth Society, a sustainable society, composed of sustainable communities, is not new. What's new is that we are doing it. It is no longer a talk, a hope or a concept. It is a reality! Sustainability is no longer a concept it is us, all of us, now, today. Human beings have the capacity to continuously adapt to their nonhuman environments by means of social organization. The graphics on the following webpage was designed to illustrate the meaning of sustainable development and other global concepts. This is why the People aspects have been included in the definition of sustainable development. This is why sustainable development is essentially not about just the environment and economic development, but it is also about people. We the Peoples of the Earth will find ways to protect and improve the delicate balance between human activity and our natural life support system. We are now working together, all of us, all Peoples on Earth, the Human Family, to keep our planet healthy, productive and hospitable for all human beings and living things. Over the past thousands of years, our species has gone through all sorts of loops and dead ends but we are who we are today: hopeful, imaginative, creative, demanding, powerful, diversified, changing, evolving, intelligent, resourceful, and a kilometre length of skills, qualifications and strengths. We have what it takes to manage Earth wisely and keep it healthy. We have formed Global Civilization, and now we are forming the Interim Global Parliament with the mandate of forming Global Parliament from the grassroots. Previously in year 2000, "The World Congress on Managing and Measuring Sustainable Development - Global Community Action 1" was about establishing the foundation for a sound Earth Management. Now the "Interim Global Parliament" has the mandate of forming Global Parliament, its organizational structure, its voting system, the elective procedure, and promoting its creation all over the world. Once representatives from every country will have to be elected, they will form the Legislative body of Global Parliament and will be governing Earth. They will decide how the Executive and the Judiciary bodies of Global Parliament will be elected or chosen. Participate now in this new Global Dialogue 2018. Global dialogues, Global 2000 and Global Dialogue 2002, and Global Dialogue 2004 show our dedication to succeed: universal values,	global concepts, the Scale of Global Rights, the Earth Court of Justice,	new local and global indicators, positive and constructive actions to sustain Earth and all life, a sense of direction for humanity, global ministries, a campaign to design the Earth flag is well on its way, and the determination of the membership of Global Civilization in forming a democratically elected Global Parliament. Global Parliament will be formed when representatives have been elected. Global Civilization will decide when there is a significant enough proportion of people throughout the world participating in this process. Nations of the world will decide if they want to participate with this process or not. No one country will be forced to participate. It just means that if the government of a country does not allow representatives to be elected within their population then their will not be representatives from that country sent to Global Parliament. It is a choice each country must make on their own. Our job is to form a government model we prefer amongst others: an Interim Global Parliament . We hope that the elected representatives will adopt the model as theirs and govern Earth. We will work together on a democratically elected Global Parliament. Its foundation, values and principles, global concepts, will be taken from the results obtained throughout Global Dialogue 2018. Every global citizen has a dream about what they want in life and future. There is only one common Vision that can fulfill all dreams. The world is now on the pathway. Earth has chosen its future and has made the evolutionary leap. Global Civilization concepts were successful in bringing together the billions of people on Earth. Everyone is now responsible in the management of Earth. The statement of rights and responsibilities of a person belonging to 'a global community' and to ' Global Civilization ', the human family has become the way of life of all Peoples on Earth. d) We are citizens of Global Civilization. We needed to take this stand for the survival of humanity and all life on Earth. With the coming of the millennium, the affairs of humanity appeared to be unfolding in more profound ways. Cause and effect was more apparent and happening more quickly. Global link-ups were already happening at a fast rate. People have found themselves urgently called upon to action for the good of all humanity. All peoples on Earth have joined forces to bring forth a sustainable global society embracing universal values related to global rights, economic and social justice, respect of nature, peace, responsibility to one another, and the protection and management of the Earth. In year 2024, everyone shares responsibility for the present and future well-being of life within Global Civilization. We have developed a sustainable way of life locally, regionally, nationally, and globally. Cultural diversity and preservation of the cultures were essential elements of the new vision. Global Civilization believed that the Universal Declaration of Human Rights had been a great step in humanity's evolution to better itself. But it was found that it needed to be left behind and reach to our next step, that is, the Scale of Global Rights . The Universal Declaration of Human Rights caused confusion in the world between nations. The reason why it caused confusion was that it needed to be improved. A lot! The West could not understand many of the things that other nations did and other nations did not understand the West Way of Life. Why? Because the Universal Declaration of Human Rights was not so universal after all. And because it did not have a scale of values as shown here. The Scale is the primary guide for the decision-making process. 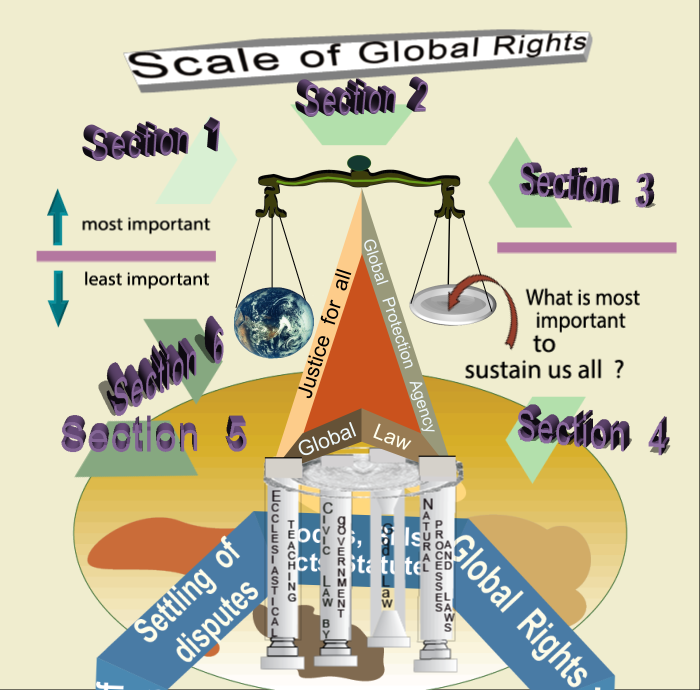 The Scale of Global Rights contains six (6) sections. Section 1 has more importance than all other sections below, and so on. More importance is given to the sections higher on the Scale, and the Scale is the primary guide for the decision-making process. Values foundation of the Scale of Global Rights. The Scale is the primary guide for decision. The Scale is a balancing process to sustain all life. Comparison between Human Rights and the Scale . The 4 pillars of Global Law. Social implications of Global Law. Scale of Global Rights definition. In this 3 rd Millennium, democracy within Global Civilization has blossomed out of the Scale of Global Rights. A new democracy! An evolved democracy! A true democracy for the 7 billion people on Earth, for all lifeforms on our planet. Primordial human rights are those human rights that individuals have by virtue of their very existence as human beings: to live, eat, drink fresh water, breath clean air, safety and security, and have shelter. These rights are separate categories than the right of the greatest number of people, economic rights, social rights, cultural rights and religious rights. Ecological and primordial human rights are the only rights that have existed unchanged throughout the evolutionary origin of our species. Any major change would have threatened our very existence. All other human rights listed here are rights created by human beings and can be changed depending of new circumstances; they are not stagnant but are rather flexible and adaptive, and they can evolve. Ecological and primordial human rights of this generation and of future generations are therefore much more important than any other human rights existing now and in the future. This is the reason for drawing the Scale of Global Rights. In year 2024, the existing and future uses of water are constantly challenged; balancing supply and demand is made even harder by the amounts of pollution found in the air, land and waters. A large part of our body is made of water, and we cannot live without water; therefore water is a primordial human right by our very nature. In order to avoid conflicts and wars over drinking fresh water, fresh water has been categorized as a primordial human right. Industrial pollution plays a major role in the deterioration of nature but this time the level of pollution is above the carrying capacity of the ecosystem. Pollution also affects significantly human health and all lifeforms on Earth. Every person needs Oxygen to live so clean air is certainly also a primordial human right by our very nature. The scale of values was about establishing what was very important to ensure a sound future for Earth, what was important, what was not so important, and what should be let go. From this scale, agreed upon by all members of Global Civilization, the assessment of world sustainable development was conducted. The benchmark was the scale established in year 2000 by Global Civilization along with the first evaluation of world sustainable development conducted with respect to the four interacting systems: social, economic, environmental and in the wise use of natural resources. Every global citizen is part of the solution to the challenges of globalisation. In this way, the private sector in partnership with the civil society can help realize a common vision: allowing a global equitable and peaceful development and a more stable and inclusive global economy. Every global citizen is part of the solution to the challenges of globalisation. In this way, the private sector in partnership with civil society can help realize a common vision: allowing a global equitable and peaceful development and a more stable and inclusive global economy. The process of building the scale was meant to be used as an educational tool by every member of Global Civilization. The Glass Bubble concept was used to build the scale. The Glass Bubble is designed to illustrate the concept of "a global community" to every member of Global Civilization as opposed to the idea a community is "the street where I live." Now let us explore this Global Civilization that we have visited and discover why each member is important ~ each bird, each tree, each little animal, each insect, plant and human being ~ and how all work together to create a good place to live. You can make or break their world. But by knowing their needs, and taking care, you can help your whole Global Civilization be a good one. History will show that the end of the Cold War has sounded the beginning of the end of superpowers. The event of September 11, 2001 has sounded the end of the last attempt of the United States in ruling the world to its own image. There are no more superpowers in the world in year 2024. History has seen the end of superpowers, the birth of Global Civilization, and the age of global co-operation and symbiotical relationships. The Global Community was truly the new way of dealing with one another as human beings. The survival of our species required a complete co-operation between all communities of the world. Nations of the world have co-operated together to fight terrorism, and they have co-operated to fight against an even greater threat: the destruction of the global life-support systems. In year 2024, by establishing fundamental aspects and criteria of Global Civilization included global governance and Earth management as the most important aspects. 12. the Peace Movement of Global Civilization, promoting Peace in the world as a way of life requires shelving the war industry forever from humanity; it has become a necessity to implement a total embargo on all US and European Union nations mass destruction chemicals, nuclear war heads, weapons, war products and war equipment. These are the countries that have developed and manufactured the weapons of mass destruction. 34. the relentless exploitation of the Moslem nations of the Middle East and of Afghanistan to make an immoral profit and obtain power at all costs, for having abused and killed and being the cause of the deaths of millions of Moslems in that region, for having invaded Moslem nations which itself is a horrible crime against humanity, against all human rights, and against democracy and freedom of a people to exist, and for the hate they have created in the heart and mind of every person in the Moslem civilization, it is recommended that America, Israel, Great Britain, Germany, and France pay eight trillion dollars(American) toward building sustainable communities in the region. Global Civilization shall administer the amount paid and manage the project. It is also recommended that the people from America, Israel, Great Britain, Germany, and France who have been involved with the exploitation and invasion of the Middle East and surroundings nations be taken to a criminal trial for their crimes against humanity by the Earth Court of Justice. 35. that the United Nations are to restructure their organization or start rebuilding it from scratch. The United Nations must reflect the needs and aspirations of the Global Community: all Peoples together, the Human Family, Global Civilization, Global Economic Cooperation, Global Governance, Earth Governance, and Earth Environmental Governance. It must become a democracy. 40. the global support for a negative grow rate of the world population. We have the responsibility of governing and managing Earth. The partnership of government, civil society, and business was found essential for an effective global governance based on global concepts, the statement of rights and responsibilities of a person, the Scale of Global Rights, and the Global Consitution. Global Civilization has help establishing Earth governance. This process started out by forming several global ministries for the management of Earth. Each ministry was given a similar power as that given to the WTO organization (the global ministry for trade). In year 2024, Global Civilization has summarized the rights of every person on Earth by developing the Scale of Global Rights. The scale has now replaced the Universal Declaration of Human Rights. Global Civilization has initiated the historical event of symbiotical relationships and global cooperation between all Peoples on Earth. An economically base symbiotical relationship exists between nations of the European Union. Several other types of symbiotical relationships were created all over the world between communities, nations, and between people themselves. They are geographical, economical, social, business-like, political, religious, and personal symbiotical relationships. There has always been symbiotical relationships in Nature, and between Souls and the matter of the universe to help creating Earth and life on Earth. National governments and large corporations had taken the wrong direction by asserting that free trade in the world is about competing economically without any moral safeguards and accountability to peoples and the environment. And now in year 2024, the proper and only way is for free trade to become a global cooperation between all nations. Global Civilization has proposed a solution that the process of trading within the planetary trading blocks be changed from a spirit of global competition to that of global economic cooperation. This is now the new way of doing business, the new way of life. New standards, goals and objectives were defined along with firm universal guidelines to keep the world healthy. New ways of thinking were embraced, new behaviors and attitudes adopted. Sound solutions to our problems and concerns were researched and developed and made available to everyone on the Internet. This was la raison d’être of Global Civilization as established in year 1985. Now in year 2024, millions of people around the world have joined the ranks of Global Civilization. Their common goals is to sustain Earth, the survival of the ones closer to themselves, and the protection of life on Earth. Global Constitution was developed and adopted by Global Civilization. Global Constitution is a declaration by every human being to the commitment of responsibility to themselves and to one another, and to sustaining all life on Earth. The human spirit has made the evolutionary leap. We all have a sense of universal responsibility, the local has linked with the global, and human compassion and solidarity and kinship with all life were strengthened. We are humble peoples, and we have the greatest respect of Nature. 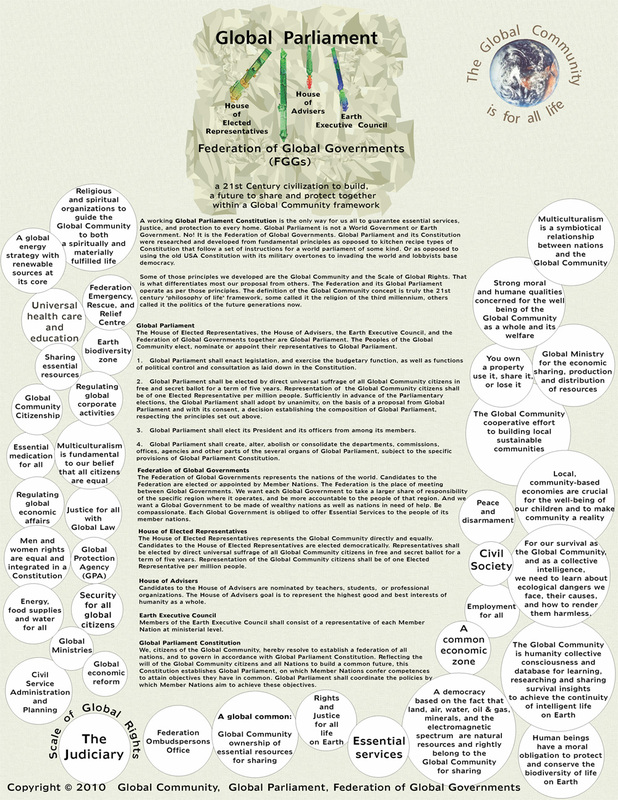 Global Constitution is an acceptance and commitment about peace, freedom, social and economic well-being, and ecological protection; it also recognizes the interactions between aspects included in the major quality systems such as: economic, environmental, social, availability of resources, ethics, spiritual values. One of the most important factors in our lives is the inter-connection we now have to others, to other countries. Through these connections we are able to create changes for good on a global scale. We are all linked to others in faraway places on a much deeper level, and we are working together to keep our planet healthy, productive and hospitable for all people and living things. Indeed, in year 2024 we have become Global Civilization. Over the past centuries, the human species has given control to leaders to govern their affairs anyway they wish. War, conflicts and human miseries, and destruction of the environment resulted. Now, today, control has been given back to the individual. Survival has forced the issue. The individual can deal with his own affairs, reach beyond his own property and family, and help to work with others living in and around, even a part of the local community he lives in ~ the villages, the town community, the surrounding territory, and so on. It becomes possible for the people of the community to influence the political chain of power to the national level and to Global Parliament. Politicians have now to deal with communities and their needs to sustain themselves. People have become conscious of the power and control they have and are no longer subject to the wishes of an unfit governing body. In year 2024, socio-political-economic reconstruction was achieved, and it is successful in sustaining all life on Earth. The key is personal responsibility. Therefore the individual is the important element, one who takes responsibility for his(or her) community. An ' individual ' here may be a person, a corporation, a NGO, a local community, a group of people, an organization, a business, a nation, or a government. Reforming the structure and voting system of the United Nations was proposed to the world by Global Civilization. It was also proposed the annulment of the special privileges of the Five Permanent Members, and the establishment of a voting system that give to each nation one vote per million people. Earth needed urgently a world system of governance. The United Nations failed to satisfy the needs of the people of the 21st Century. They had never improved upon the old ways and thinking of the middle of the 20th Century. Its voting system no longer satisfied the 7 billion people on Earth. The challenges are different today and require a world organization up for dealing with the needs of all Peoples. During the past several decades, Global Civilization has been pleading the United Nations leaders to make changes in the UN organizational structure and ways of doing things. There was always an urgent need for fundamental changes in the United Nations organization. The world wanted a true democratic world organization. The UN was not! Global Civilization requested that the United Nations change its voting system to have one vote per million people. This way the developed nations of the North had to deal with the developing nations of the South in order to obtain votes for decision-making. Thousands of good things were to be achieved. The most fundamental requirement of a world organization is a democratic voting system. Democracy must be a priority. The right that the greatest number of people has by virtue of its number (50% plus one) is a human right. It should be respected. Surely, no one believes that organizations such as the European Union and the Free Trade Area of the Americas, or the like, are a substitute to a democracy. They are driven by profits only and are a form of "world anti-government". In the Preamble of the Charter of the United Nations, it says 'WE THE PEOPLES OF THE UNITED NATIONS' but in fact any of the five permanent members of the UN has the power to overthrow a proposal brought forward by any member. Global Civilization proposed a voting system based on democracy: one vote per million people. In total there are 6104 votes. Taken apart the actual five permanent UN members would have a total of 1810 votes i.e., less than 30% of the total number of votes of 6104 votes. A basic democracy requires a 50% plus one vote for ruling. The above calculations were counting all five permanent members together but in fact any of the five members has the power to overthrow a decision brought forward by any of the 190 Member States of the United Nations. This means 1/190 or 0.5% of the membership is more powerful than the remaining 99.5%. If that is not a dictatorship, what is it? It does not say much about democracy at the UN. More like a dictatorship of the five permanent members. Now in year 2024, every global citizen has the right to receive the Universal Health Care. As defined in the early 1985, the concepts of ' a Global Community ', 'personal sustainable development' or 'personal sustainability', and that of 'well-being' have now become the basic building blocks of the new societies and of Global Civilization. They assume quality relationships and responsibility to one-self and others, and dealing wisely with consumption, work, finances, health, resources, community, living, family, life purpose, wildlife and the Earth. In year 2024, a mathematical model (a universal quantum computer would be needed to conduct a proper evaluation of a plausible model or scenario of what Earth might become in year 2024) is now in placed to measure sustainable development locally and globally. Local/global indicators have been developed for assessing and measuring sustainable development. All peoples around the globe help the Global Community Assessment Centre (GCAC) to measure, assess, and integrate the interactions and present results to Global Civilization. A more balanced world has grown by insisting on societal checks and balances. Results lead to policies for the management of global changes and are the supporting scientific framework from which new decisions are made. GCAC presents to Global Civilization an annual assessment of the world changes which gives us a sense of direction as to ensure a sound future for Earth. The Global Community Assessment Centre (GCAC) is the assessment Centre for Global Civilization. It was created to give individuals and governments worldwide help and/or advice about negative events happening in their communities which cause concern to people, resources, industry or the environment. GCAC is also the Centre of assessment of local/global indicators about the four major quality systems: Environment, People, Economic Development and the Availability of Resources. The assessment of these indicators will result in giving the Global Community a sense of direction as to ensure a sound future for Earth. In order to do this, GCAC will continue to amass a body of scientific information based on formal assessments such as those on Biodiversity, Climate Change, Human Development Report, World Development Report, struggle for Global Rights, life species Conservation, Health, Economic Analyses, Commission on Sustainable Development, etc., which have bridged the distance between incomplete science and contentious policy. Local and global indicators developed by Global Civilization will also be used as basic scientific information. Furthermore, no one really understands what assessment processes have been most effective in the past, or why others have failed. GCAC’s goal is to explore how assessment of local/global indicators can better link scientific understanding with the progressive implementation of effective policy solutions to global changes. Achieving this integration is fundamental. Global Civilization needs this annual assessment to effectively manage global changes. Since 1985, hundreds of indicators were measured and integrated into two overall expressions called the Gross Environmental Sustainable Development Index (GESDI) and the Gross Sustainable Development Product (GSDP). GESDI measures sustainable development locally and globally. It expresses the quality of development. GSDP measures the costs of development. Education has become a mean to train everyone of us in sustaining Earth and in the skills of collaborating in the management of global change. Children throughout the world are now being educated in sustaining Earth. We are all connected by this common goal. Each one of us is a global citizen from birth. Each one of us belongs to Global Civilization. During the past decades various changes have taken place in political, economic and social institutions. Economic reforms, changes in national policies, and global concerns have contributed to redefine the roles of these institutions for Sustainable Development. Global Civilization is a social, political and religious movement in the sense of having a broad organizational structure and an ideology aimed at governing. The environmental movements within Global Civilization has investigated and given due consideration the concerns of groups of people regarding depletion of water, climate change aspects, degradation of land and other changes in ecosystems affecting traditional patterns of natural resource exploitation. Global Civilization has taken the role of helping these groups in protecting and managing the environment by coordinating efforts. Earth Environmental Governance is the most importance and urgent challenge of Global Civilization. In yearv 2024, there has been a rapid change toward the expansion of human consciousness. Spiritual growth has strengthened the connection between the higher self and Soul, and has helped the human intelligence in making wiser decisions for the proper management of Earth, and in bringing clarity of thinking, creative solutions, and useful insights. Thoughts, feelings, and attitudes of a lower nature have left humanity and have been replaced by those of a higher nature. To each thought we have learned to associate energy and an emotional state, and it has become easier to the human mind to deal with the everyday life happenings by simply interacting with others on this basis. We can choose how we want to feel and the thought we want to think. It has become easier to let go of those things that no longer serve human survival and sustaining the Earth. We now create those things that do. In year 2024, Peoples are experiencing a constant flood of new information and input from many sources. We have become more aware of other people's realities and have developed the quality of discernment. Everyone has become more self-reliant, creative and attracts more opportunities to make a difference in the world. Everyone has a clearer vision of what to do to sustain Earth. Everyone has a stronger connection to Global Civilization and its organization, and this makes it easy to attract new opportunities. Over time the human mind has become more balanced, stable, creative, and clearheaded, and is now able to manage all life on Earth. New services are offered by universities all over the world. The international center of every university has been replaced by a branch of Global Civilization. 9. A Universal Health Care and an employment center on behalf of Global Civilization. Over the past two decades the Earth has experienced unprecedented growth in population, urban activity, community living, small businesses and in ' clean ' high tech products and technologies used in communications, transportation, homes, and in the commercial and industrial sectors. In year 2024, new environmentally conscious technologies and strategies were developed to handle waste products. Most waste have been eliminated from production processes. A mix of economic policy instruments was introduced to render waste minimisation to an ' acceptable ' level. There has been a major shift to a sun energy system. Global consumption and the productive capacities of Earth have been managed from the perspective of the global structure of production and ecological impacts. In year 2024, land use encourage higher residential densities throughout the urban area and especially in areas closer to transit services. We see more mixed uses of property and mixed land uses. Rigid zoning of land has been abolished. A Sustainable Community Development Code keeps contractors in line and is a complement to the Building Code. Sustainable suburbs render development along city's edges affordable, environmentally friendly, and are the sites of interactive and diverse neighborhoods. Building designs make it easier for people to work at home. Community designs make it easier for residents to start up a small business, and carry on their trades. The local community organization itself finds it easy to start up a small business, and carry on their trades. Communities are more stable, self-reliant, and self-sufficient in all areas such as energy, garbage and sewage disposal, and food. People have taken responsibility of their built environment, and communities are environmentally, socially, and economically sustainable. Urban indicators show a continuation of this well established trend of dynamic growth and prosperity. We now see a widespread use of alternative fuels and ' clean ' products. Privatization of public services to small and medium size businesses has had the effect of increasing quality and quantity of services. Small and medium size businesses are more common, and socially acceptable by Global Civilization, and they are driven by global business ethics everyone has agreed upon. Business leaders are much more sensitive to the greater, wider needs for their expertise and are already in the process of creating a new kind of civilization. Transportation has deeply changed the cultural melting pot of cities and community living. Transport of passengers and goods were made more efficient, safe, and economical through a " use pay " system to cover costs of the transportation networks and pollution abatement. Cities require an environmental impact assessment and public review to be conducted whenever there is a need for new transportation links, development or river crossings. Transit is critical in mitigating environmental degradation so, today, ridership levels are high; services are closer to people and their work places; ' clean ' technologies and alternative fuels are well in use; and policies and strategies are in place to discourage the use of the car and need to commute, and encourage the use of transit, walking and cycling. Transit and other Public Services are contracted out to small and medium size businesses to increase quality and quantity of services. In year 2024, Global Corporate Ethics are now well established and have become the ways to do things when conducting finances, business deals, business transactions, and dealing with labour, customers, consumers, partners, shareholders, suppliers, community issues, human rights, ecology, safety and health issues in the workplace, social justice, and all related women, children and minorities issues. New business performance indicators were developed and are now in use to assess business conduct. These indicators were designed to be integrated within the framework for the measurement of sustainable development. Each company now has corporate statements (along with policies and practices statements) in place which stipulate that the company actions will be responsible. A ' good corporate individual ' was defined to include all social and environmental expectations within the framework of sustainable development. Corporate social and environmental performance standards must be met. Corporations themselves have taken their responsibilities by becoming involved in designing and implementing social and environmental responsibility performance. The monitoring of corporate codes of conduct is also done by corporations themselves. Measuring corporate responsibility has had the effect of improving business performance. A workable type of Tobin tax is in place, and it is a powerful instrument to promote sustainable development. It has minimized the effects of financial speculation and currency crises are no longer to fear. Global Civilization was given the task to manage the tax and is used entirely to finance a global sustainable development. The Global Community Assessment Center has been active in findings sound solutions to sustain Earth and its peoples. Two decades ago, the state of the world was the result of a specific set of interlocking institutions: the IMF, the World Bank and the WTO. These institutions were designed to generate massive wealth for the few and poverty for the rest. The same people who made the decisions in government and corporation made the profit. They created a tight concentration of power. Together they were a form of anti-government whose only goal was profit. The IMF, through Structural Adjustment Programs, was directly operating the economies of over 70 countries. That meant that about 1000 economists and bureaucrats controlled the economic policies for 1.4 billion people in these countries. That was a form of anti-government. The people that profit most from the global economy were white people. The people who were most oppressed by the global economy were people of colour. Racism and sexism was then the norm. The entire planet was in a state of low intensity civil war. The ruling elite profit off of the exploitation of the rest of the world. At that time, Global Civilization was looking for a method of raising global taxes, of redistributing incomes to the poorest communities, of providing debt-free technical assistance to non-industrial and developing countries to help them out of poverty and to meet environmental and social standards, but there it was all along right on our eyes. The Earth Court of Justice was asked to decide on the debt be changed into an actual tax to be paid by the developed nations to the developing nations, and to decide on the amount of tax to be paid. The United Nations were also asked to pay a global tax. Developing nations were then able to start rebuilding their communities as per the Scale of Global Rights and the Global Constitution. They were no longer forced to satisfy the economic needs and wishes of developed nations. The Earth Court of Justice was also asked to rule illegal the activities of the IMF, the World Bank and the WTO until they became a part of a greater whole such as the Earth Ministry of Financial Institutions, a part of Global Civilization. These institutions are now controlled by the greater whole. In year 2024, the formation of global ministries is a new symbiotical relationship between nations. With the formation of a ministry comes the definition and development of the ministry into an active part of Earth governance. And with governance comes the necessity of ruling between concerns, crimes, and even the establishment of a new nation in the world. The Earth Court of Justice will be prosecuting criminals as well as ruling on major global issues. In year 2024, the Earth Court of Justice established by Global Parliament as the principal organ of Global Civilization now hear cases involving crimes related to the global ministries. America was the first nation to be prosecuted by the Earth Court of Justice for a global environmental crime. Because USA Congress was responsible for not signing the Kyoto Protocol and all other subsequent agreements, the USA President was the first to appear in Court. The reality here is that every American was on trial. During the past decades, a large majority of consumers in USA were responsible for producing the gas causing global warming, and they were all on trial. It was a crime against humanity and all life on Earth not to ratify the Kyoto Protocol. It is a terrible crime against the global life-support systems, against the very existence of the next generations. On the Scale of Global Rights, the crime is of maximum importance. America was found guilty of killing billions of human beings and countless life species because Americans had closed their conscience to the reality of life on Earth. Justice must found to prevail to stop the "killing fields", and they were found guilty as charge. In year 2024, Global Civilization has given back responsibility to every citizen on Earth. Everyone shares responsibility for the present and future well-being of life within Global Civilization. We will work together in working out sound solutions to local and global problems. It would be wrong and dishonest to blame it all on the leader of a country. Most problems in the world must find solutions at the local and global community levels (and not assume that the leader alone is responsible and will handle it). There is a wisdom in the ways of very humble people that needs to be utilized. Every humble person deserves to have ideas respected, and encouraged to develop his or her own life for the better. Sound solutions to help manage and sustain Earth will very likely be found this way. Everyone can help assess the needs of the planet and propose sound solutions for its proper management, present and future. Everyone can think of better ideas to sustain all life on Earth and realize these ideas by conducting positive and constructive actions. When there is a need to find a solution to a problem or a concern, a sound solution would be to choose a measure or conduct an action, if possible, which causes reversible damage as opposed to a measure or an action causing an irreversible loss; that is the grassroots process. Global Civilization can help people realized their actions by coordinating efforts efficiently together. Global Civilization wants to provide a forum where international conflicts could be argued and resolved peacefully. Because of hatred and mistrust, disputing parties always find it difficult to express constructive ideas or proposals. A face-to-face meeting may not even be possible. Global Civilization offers to be a trusted third party that would carry ideas back and forth, put forward new proposals until both sides agree. When both parties feel they have gained more than they have lost from the process, the outcome is a win-win settlement for peace. The worst environmental degradation happens in wars. Farm products in fields and livestock are abandoned, there is no more control on toxic wastes, and water, air, and land are polluted. People are displaced and feel no longer responsible for the quality of life in their communities. Historically, the industrialized nations have caused the most damage to the environment, with their careless technology and policies. Emissions from factories and vehicles have caused ozone depletion and acid rain. Leaders of the wealthier nations must be willing to accept responsibility for past mistakes and to help pay the financial burden for environmental protection of the developing nations. This is the most damaging conflict of interests between the rich industrialized countries and those that are poor and struggling just for existence. Global Civilization must help wealthy and poorer nations reach a better understanding of each other's needs. All aspects are interrelated: peace, human rights and the environment. The poor is more concerned with ending starvation, finding a proper shelter and employment, and helping their children to survive. Environmental issues become meaningless to the poor. In reality, all concerns are interrelated. As soon as the environment is destroyed beyond repair, human suffering is next. Ecology has no boundaries. All nations suffer the effects of air pollution, global warming, loss of biodiversity, soil erosion, acid rain, ozone depletion, silting of streams, and countless of other environmental problems. This was the reason for proposing to Global Civilization the Scale of Global Rights. Global Civilization has already described a scenario of Earth in year 2024. We have participated in global dialogues in year 2000, 2002 and 2004. Participants have presented their views, research papers and we had workshop sessions and made recommendations to all nations. The Vision of Earth in Year 2024 has resulted from our common work. We gave humanity a sense of direction. *	we stood for the values we promoted no matter how difficult was	the obstacle. Participate! Be a Leader! Be a minister! Now is time to expand our work for the good of all humanity. We will research possible scenarios of humanity between now and a not-so-distant future. Everyone is asked to participate. Send your thoughts. Read the work done so far especially the work done with the global ministries. In year 2024, freedom of lifestyle is more important to them then mounds of possessions. These young people are not trapped by "things" although they own the best of sports equipment and outdoor clothing, being very health conscious. They eat very well. In year 2024, living with a group of friends in a Space Age may involved jobs in Space. Take Tourism for example. The Tourist Trade is making a very clear statement about its future ~ at present the practice is to take customers to all the remaining unique cultural outposts for the picturesque experiences ~ but since the aboriginal people who live there tend to ape their viewers with such alarming speed, soon the only place Tourism can advertise is Outer Space! One very re-assuring fact is that the young people of to-day are interested in all the secret wisdom behind all the existing religions and sifting out the common truths. They seek the best of the best. They are aware of the Soul of Humanity and have established a spiritual symbiotical relationship with it. They seek the exaltation and merging of their Souls into one to gain strength, friendship, creativity, love and light. In year 2024, their childhood conditioning has prepared them to act on a firm understanding of what it takes to get along with others, working as a group. In year 2024, they are educated to understand a broad panorama of human truths ~ all those universal needs and rights every one shares. The Scale of Global Rights has become an inner truth and the benchmark of the millennium in how they see all values. The Earth Court of Justice has brougth security, Peace and Justice for all. They no longer fear the unknown as Justice is for everyone and is everywhere, a universal constant. In year 2024, what we have here is the birth of genuine group concern and unconditional support for the individual's well-being ~ a giant leap in human behaviour which could well change the functioning of global communities everywhere. We are becoming the human family. Global Civilization has made grounds in peoples way of life. Over the past several decades, our research team at Global Civilization Assessment Centre (GCAC) has shown over and over again that global warming is here and we need to act now. 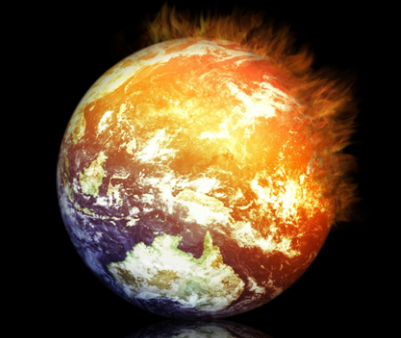 The planet is getting warmer. Ratifying the Kyoto Protocol is only a first step to protect our global life-support systems. Much more has to be done. From a religious perspective, why will it matter whatever we do now on Earth when eternal life is next? This is also a pessimistic view. A large cross-section of people think that way. It just seems that life is defeated before even trying to fight for our survival. Unless God gives these people new Revelations about	the worth of managing Earth than life does not stand a chance. When we think about life on Earth we must think as a matter of course in very long periods of time. Whatever happen in this 3rd Millennium, which we have called Global Civilization of the 3rd Millennium, will depend of us, and to what degree we are willing to make a difference to manage wisely life on Earth, our home. Will our actions be geared to survive a decade, a hundred years, a thousand years, or a million years? If our actions were geared to survive a million years, the chances are that we would learn to master great things including harnessing the sun flare energy, interstellar travel, genetic engineering, and reajusting the planetary position of another planet in our solar system to initiate a new life on its surface. Is it no worth to make sacrifices now? A sound governance and management of life on Earth is needed for the long term survival of our species. This is 'la raison d'etre' of the Interim Global Parliament proposing the creation of global	ministries to manage Earth and humanity's global problems. We are just beginning to see what a dangerous game we are playing. More specifically we begin to see how inadequate it is to think only in shorth periods of time, and to be satisfied with politics and policies of economics that deal only with the here and now. Over the past several years Global Civilization has fought the economic systems of the world requiring that the FTAA, the EU and the WTO be governed by the Scale of Global Rights and Global Constitution. The Scale was	designed for the survival of our species and that of other lifeforms we want to take along with us. In year 2024, Peace in the world is a state of being at peace within ourselves. Justice keeps us at peace. When there is no justice, human rights, peace and security are threatened and war is often thought as the only solution. Global Civilization believes that the United States have not accepted the principle of justice for all in humanity. They have already objected to have their military be subjected to the international court. They want a special treatment over and above the other nations of the world. As far as they are concerned, Justice is only for the other nations not for the US. So it is no wonder that war is at the horizon. The US can break the laws but not the other nations. There is no justice! This means Americans dont feel at peace within themselves because they are guilty of something terrible. We all know what this is. The whole world knows Americans have planned to invade the Middle East nations and other nations as well ever since they coerced the United Nations in creating the State of Israel, the Jews of Israel being their Trojan Horse. Americans are invaders, nation predators, just as the British were in the past. They will not stop at the Middle East, we all know China is their next target. If they get what they want, they will make Adolf Hitler look like a kid in the block. There will never be Peace this millennium. The September 11 event was a desperate response to this threat, and yes of trade issues as well but then what is trade when the US military is left out of Justice? What is trade when the US military is taken over a nation's resources? Trade has no meaning except when the US is getting richer at the expenses of all other nations, including Canada, and at the expenses of the global life-support systems. The US is willing to disregard global warming as 'the major threat to the world' today, to all life on Earth. The risk is insane! America has lost credibility as a leader nation. America needs to be told with action that global warming is here and now. America needs to be told that it wont matter all the oil in the world and all the Saddam Husseins in the world if we do not protect our global life-support systems. Humanity needs a leader with integrity. Be that leader! Kyoto is only a beginning. There is a whole lot	more work to do to save humanity and all life from extinction. As far as the US are concerned they lost their mind, heart and Soul. Dont follow into their steps. There is a chance that they might follow into yours. As far as an action to be taken to bring America in line with the rest of the world, close the Canadian border from coast to coast to all consumer products, goods and services going back and forth, and triple the prices of oil, natural gas, coal, electricity, wood products, food products, water being sold to America, until they have	agreed and taken all actions to resolve the problem with global warming and peace in the world and that means no war.